Based on the evaluation of hundreds of responses, and sorted alphabetically, here’s a list of the 12 shows mentioned the most often. 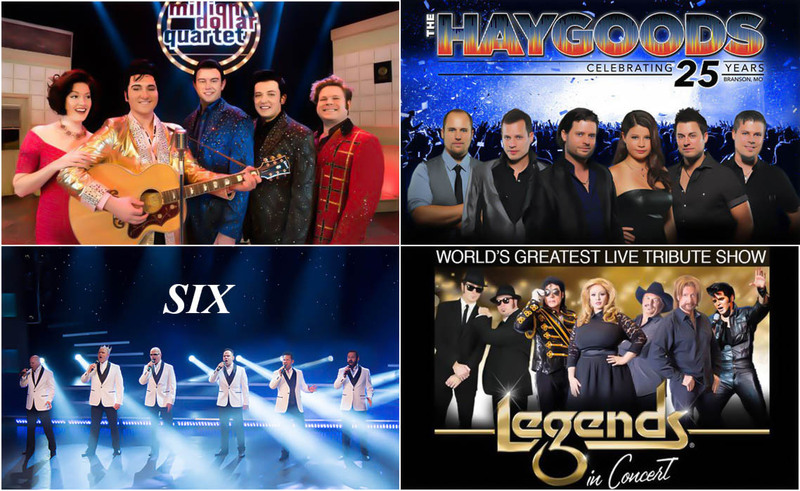 Interestingly, all are also listed on Branson Tourism Center’s List of Most Popular and Highly Recommended Branson Shows. We hope that you will find it useful. Clay Cooper’s Country Express is filled with dancing, comedy, singing, 24 veteran entertainers, and backed by a live band. You’ll hear a variety of music – old and new country, rock n roll, current hits, gospel, and patriotic! It’s more than just country! You don’t want to miss it! Dolly Parton’s Dixie Stampede is the perfect family destination in Branson for exciting entertainment and a fantastic, hope-you’re hungry, four-course feast! Arrive early for the new pre-show, The White River Wranglers, and only in Branson, see Canine Capers! This stunt dog relay event includes Fly-Ball racing, agility course, and high jump and features all rescue animals, specially trained and guaranteed to please the dog lover in you. The Grand Jubilee boasts tight harmonies and a variety of musical styles; a show custom-made for all ages! Enjoy the dynamic performance of New South, a quartet that can play it all, from country and gospel, to rock n roll favorites! Jamie Haage and emcee extraordinaire, Mike Patrick, will keep you in stitches! The Haygoods is an amazing Branson experience! Excellent choreography, exquisite harmonies, state-of-the-art sound and special effects, a delightful sense of humor, and energy that never quits, you get it all in one show from one phenomenal family! It’s easy to see why “The Haygoods” pack the house night after night! “it” Starring the Hughes Brothers fills the Branson stage…literally! More than 50 members of the Hughes clan employ a wide array of musical gifts, including magnificent dance moves, exceptional skill on a variety of instruments, and vocals highlighted by impeccable harmonies. Legends in Concert is the world’s greatest tribute show! Amazing artists deliver uncanny performances of huge stars; the revolving lineup features Elvis, Bruno Mars, The Blues Brothers™, Prince, Aretha Franklin, Johnny Cash, Michael Jackson, Adele, George Strait, Barbara Streisand, and Frank Sinatra. The Million Dollar Quartet captures a singular moment when four of the most extraordinary musical talents – Elvis Presley, Johnny Cash, Jerry Lee Lewis, and Carl Perkins – came together for one unforgettable night! Hear songs like That’s All Right, I Walk the Line, Riders in the Sky, Hound Dog, Peace in the Valley, Whole Lotta Shakin’, and Blue Suede Shoes and many more. Moses, the biblical tale, is an epic adventure of one man’s journey from humble and broken to the follower of God who delivers the children of Israel from enslavement, performed by a phenomenal cast, astonishing sets, and stunning costumes. Pierce Arrow puts the hot in Branson entertainment! Always cutting edge and top quality, you can count on these seasoned performers to put on a high energy show and to change it up throughout the year. “Pierce Arrow” has created a loyal base of fans who return time and again for a show that’s always offering something new! Presleys’ Country Jubilee, celebrating its 50th Anniversary this year, continues to be a mainstay on the list of Branson experiences you can’t miss! Long before Branson, Missouri was known as one of America’s top vacation destinations, the Presley family had people from across the country lined up every night to see Branson’s First Family of Entertainment. SIX is Branson’s sensational sibling singing group that quite simply defines the art of performing music without instruments! Sensational harmonizing, polished professionalism, zany on-stage antics…it’s the most talented half dozen guys you’ll ever meet! They’ll charm you right from the opening note! The Texas Tenors continue to be one of Branson’s most popular acts! Ever since we met the extremely talented and exceptionally charming trio of handsome troubadours on America’s Got Talent, they’ve been delighting fans with several genres of music; country, gospel, pop, Broadway, and classical. Enjoy favorites like Rocky Top and Unchained Melody. For additional information on these and other Branson attractions and shows, please contact the Branson Tourism Center, one of Branson’s largest and most respected vacation planning services, by calling 1-800-785-1550, or by visiting www.BransonTourismCenter.com. This entry was posted in Branson Shows, Featured on September 30, 2017 by Gary Groman.